Australian and New Zealand players are offered an extra deposit service that other players around the globe don’t get access to, and it goes by the name of POLi. This service is secure, quick, and makes funding our accounts to play keno online incredibly easy. We have everything you need to know about the payment method here, as well as a step-by-step guide to make it even easier to transfer money to play real money keno online. Note: As of 2016, POLi no longer accepts payments made to online gambling sites. 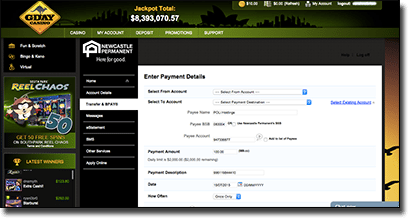 This information provided is a guide only of the online keno deposit process before POLi payments were restricted. 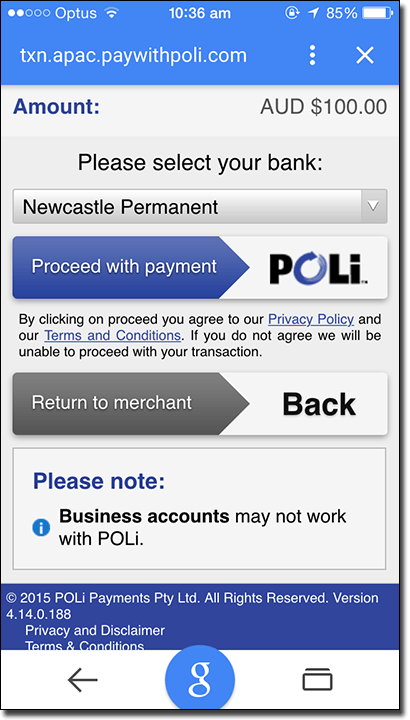 POLi is basically like an instant bank transfer but only Aussie and NZ players can use it. It is an online debit method which allows players to send money to the online casino that offers keno via Internet banking, but it is processed quicker than normal wire transfers. Paying with POLi is a great option for those who opt for bank transfers due to the high level of security but hate how long it takes to process. Some Visa and MasterCards cannot be used at Web casinos. This isn’t because of MasterCard or Visa, nor is it because of the online casino, rather some financial institutions such as Citibank, do not allow gambling transactions to be made with their issued MasterCard or Visa credit or debit cards. Therefore, POLi acts as a great alternative for those can’t use their preferred payment method, or just don’t want to enter personal information such as their card details at an online casino. What are the requisites of POLi? The number one requisite for funding your account with POLi is having Internet banking. If you don’t have this, but want to pay with POLi, you will need to sign up for Internet banking by going into your bank branch. Additionally, your bank needs to be supported by POLi. Depositing using POLi is very simple. We have detailed a step-by-step guide here to make it even simpler. First, sign up to your preferred keno casino. We recommend picking one from the list below, as they all meet our criteria of a trustworthy, fair, and reliable online casino that offers keno. Once logged in head to the banking page. It could also be a link called ‘deposit’ or ‘cashier’, depending on the web casino you are playing at. 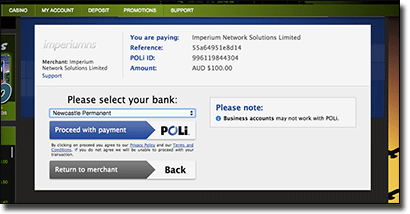 Next to the POLi logo on the list of payment options enter the amount you wish to deposit and then press confirm. Most online keno sites will take you to another interface or open a new window asking you to confirm the deposit with POLi once more, in which you will need to press ‘confirm’ again. You will then be taken to the POLi interface where you will be asked to choose your bank from the list we included above. Choose you bank account and click on ‘proceed with payment’. You will be connected to your Internet banking where you will need to enter your online banking details. Remember, Internet banking details are secure if you’re playing at a secure online keno casino such as the many we recommend. You will then be logged in and taken to your transfer funds page within your Internet banking account and all of the details will be filled out for you already, you will just need to pick what account you are using to pay and then confirm the transaction. A receipt of the transaction will be sent to the site you’re playing at, and your funds will be processed quickly and appear in your account so you can get playing. If you have any problems you can contact the online casino that you’re playing keno at. This is another reason why it is crucial to play at a reputable online casino or keno site as if you need help you need an above average support team, which our recommended reputable online casinos have. Since we are taken to our Internet banking account via the online casino, we can feel a bit skeptical about entering our online banking details. However, since POLi uses a proxy to access your Internet banking through their servers they implement the most advanced digital encryption technology possible so no one can get access to your details. For extra measure, playing at a web casino or keno site that implements their own modern encryption technology, means you won’t be subjected to hackers stealing your details. We include a list of safe sites for you to play keno at below. POLi doesn’t store any information or cache it either so you can be ensured that they aren’t keeping your Internet banking details on file. Can you use POLi on your smartphone or tablet? POLi is compatible with all mobile platforms (standard phones, smartphones and tablets) that you can access the online casino or keno site on. You follow the same steps as above, but you’re tapping your details in instead of clicking. The interface may look a bit different when it comes to tapping in your online banking details, but you are just on the mobile site of POLi rather than being taken to the mobile site of your online bank. It is still secure and still operates in the same manner. Many of our recommended online casinos that offer an array of keno variants accept POLi as a deposit option. Depositing may be a tiny little bit different from the above step-by-step guide depending which Internet casino you choose, but only with the first few steps.